For more than 30 years, the name Createx has been directly connected to modern airbrush art and design. 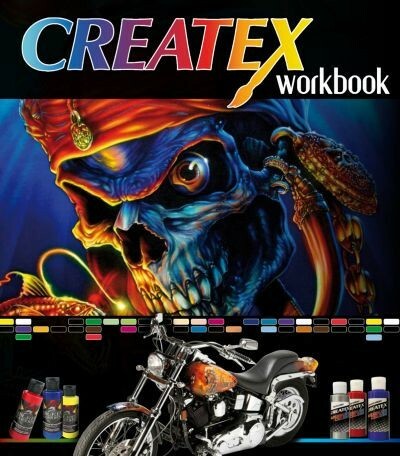 This workbook shows the many possibilities for the application of Createx Colors on all sorts of backgrounds such as t-shirts, walls, fingernails, metal, wood, leather, paper, synthetics or casts. An international team of renowned airbrush artists will provide step by step directions to show you how breathtaking works of art can be created with Createx paints. This book includes contributions from Dru Blair (USA), Terry Hill (USA), Giorgio Uccellini (UK), Corrado Mallia (Canada), Peter Tronser (Germany), Wolfgang Leidlmayer (Austria), Benyamin Gart (Sweden) and Marcus Bohler (Switzerland). Related links to "Createx Workbook"
Customer evaluation for "Createx Workbook"